Home » Adventure Travel » Can Shopkick Kick the Travel Industry Into Action? Please indicate below the emails to which you want to send this article: Can Shopkick Kick the Travel Industry Into Action? Imagine if a travel destination or property rewarded you for just visiting it, or just walking through the door of a hotel or B and B , or setting foot on an island. Would that encourage a more loyal following and generate more business? By any standard, we’ve reached the tipping point with mobile usage. As of October of 2010, 61 million U.S consumers owned smart phones, up from 14% from the previous three months, reports comScore, a digital marketing company. And it’s probably safe to say the emerging, driving force behind the use of mobile devices, at least in the U.S, will be capturing discounts and deals- and getting customers into shops and stores and to destinations. So, the company gives rewards and discounts for simply walking into a store. Even Whrrl hands out useful, tangible rewards (skip the badges and mayorships) for downloading its app, and performing simple digital actions like checking in. But Shopkick seems to have differentiated itself from other location enabled applications like Whrrl. Unlike Foursquare, Whrrl or Gowalla, Shopkick does not depend on GPS triangulation which, CEO and co-founder, Cyriac Roeding says, is too inaccurate. Apparently there’s an error radius of 500 yards, so it’s not really possible to know, with most location based devices, if one is in the store, the parking lot or around the corner with no intention of going to the targeted store. And Shopkick is not, strictly speaking, a social networking tool. It’s not about letting all your friends know where you are. It’s built around the act of going out shopping, and making that a fun, personal and rewarding experience. Shopkick has a (patent pending) device, a small box, located in the store that pings a customer’s smart phone only when they’re actually in the store. The customer starts to earn “kickbucks”. A simple walk into a store can earn 100 kickbucks. Buying something earns more kickbucks. 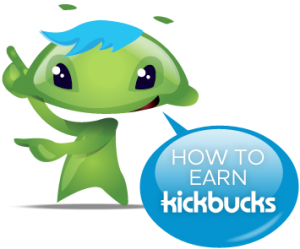 Get a certain number of kickbucks and you can earn a gift certificate or other awards and discounts. SportsAuthority has Shopkick in more than a hundred of its stores, and keeps doubling and tripling the awards to walk-ins…and has seen its walk-in numbers grow 50%, to 70%. Shopkick’s demographics are decidedly different from Foursquare’s: more females users than males, and they skew older. The company has many plans in the pipeline, including a grand kickbucks prize of 4.25 million of them.